which was carried out on Nov. 3rd, 2008 in Soka, has been uploded by Mr. Omata. 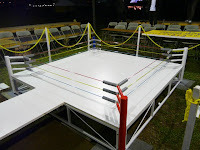 For 'Robot Professional Wrestling Match, Dekinnoka 2', the ring surrounded by 3 ropes with red and blue corner like real 'Professional Wrestling` was prepared at Taspark Hotel in Nagai City. 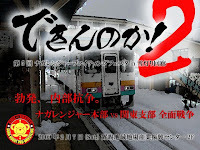 The Dekinnoka 2 was carried out as an entertainment show after the 5th Nagaranger Fighting Festival. Two teams, ‘Nagaranger Headquarters’ and ‘Nagaranger Kantou-branch’ fought robot professional wrestling matches. The first match was a tag match. The blue corner are Nagare-Ravender and Nagare-Gold from Nagaranger Kantou-branch. The red corner are Nagare-Shining and Nagare-Yellow from Nagaranger Headquarters. Katou-branch team won the tag match. The second match was a single match. The blue corner is Nagare-BLACK TIGER NEO from Nagaranger Kantou-blanch. The red corner was Nagare-BLACK. 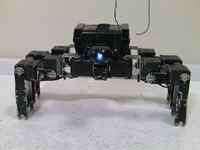 Nagare-BLACK TIGER NEO was autonomous robot and Nagare-BLACK was radio controlled robot. Nagare- BLACK won the single match. The final match was a single match. The blue corner is Inujiro. The red corner is Garu. 'Garu' is one of the famous robots in Japan controlled by Kumama who is wife of Kupapa. 'Inujiro' was a little dog shaped robot made by Ms. Naoko. Garu threw Inujiro using back drop for three times, however Inujiro won the match using cross arm hold. 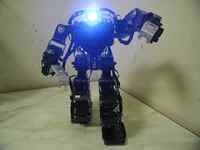 Mr. Omata also carried out another Robot Professional Wrestling Battle, 'Dekinnoka 2.5 `on Feb 11th, 2009 in Tokyo.